Moving day finally rolled around for us this past weekend. I always forget the complete chaos that happens during a move – on both ends of it! For the past several days, we’ve been doing take-out and pizza, but I was longing for something a little more homemade. Luckily, I had packed my bag of Late July Organic Chips in my cooler with my Stonyfield Greek Yogurt, cheese, and a few ripe avocados. 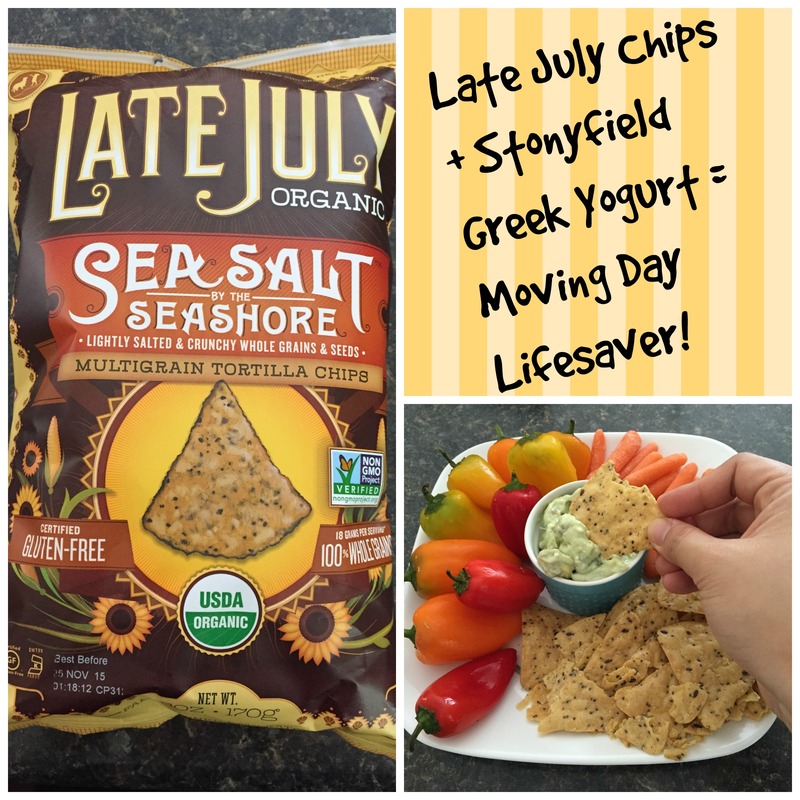 I quickly searched for a dip recipe on the Stonyfield website on my phone (we still didn’t have internet yet!) and found this Blue Cheese Avocado Dip recipe. I had most of the items on hand, so I whipped it up in the one glass bowl I could find. It was super easy, tasty, and a perfect afternoon snack in the midst of unpacking boxes. I adapted the recipe from the Stonyfield site because I used whatever I had brought with me from my old house. The original recipe can be found here. 1. Combine all ingredients in a mixing bowl. The avocados can be mashed directly in the bowl. Thank you Stonyfield and Late July for giving me a little piece of delicious sanity in the midst of unpacking 1 million boxes! By the way, anyone want to come help me finish unpacking?